How do I post a campaign status update? From your Admin Dashboard, expand the "Fundraising" Tab and click on the "Campaigns" section from the dropdown. 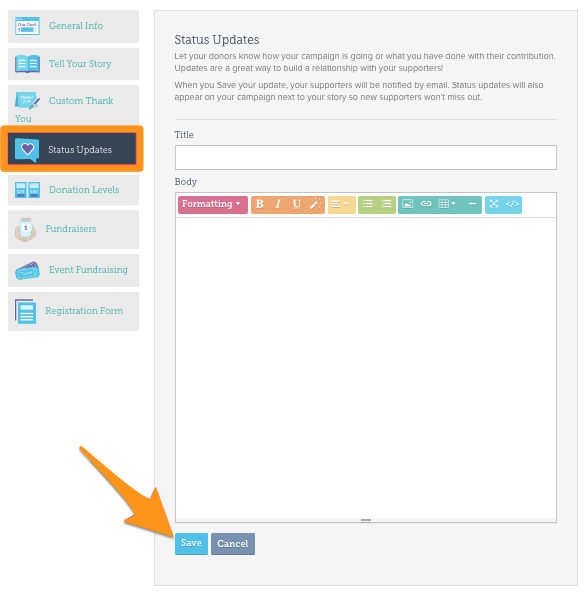 From the "Campaigns" section of your Admin Dashboard click on the Campaign you'd like to send an update for. Now that you're in the editor, select the "Status Updates" tab on the left-hand navigation bar! Add your title, then type and customize your text to create a unique status update. (You can even add a photo, if you'd like!) Be sure to "Save" your work before navigating away from this section. This status update will be emailed to your supporters, as well as featured on your campaign page so all current and future supporters can see the news!